I was up early this morning, and in the half-hour before having breakfast with the family I took a walk around the property, enjoying the post-dawn light. Amic, as usual, accompanied me. 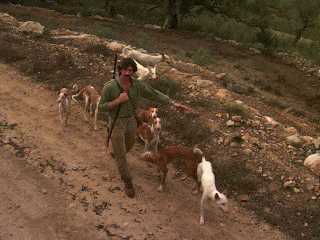 On the path (road) in front of the house came a small pack of dogs, in the center of which was a man about my age with a rifle over his shoulder. 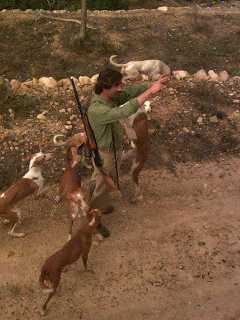 The dogs were yipping up a storm, and Amic was straining at his collar. The man and I exchanged morning pleasantries and he went on his way, dissapearing around the next bend. 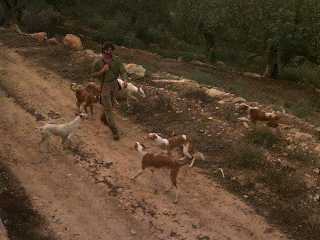 When I let go of him, Amic followed a bit of the way, barking, defending the homestead. In the house I found out that the dogs are padinkos, a breed of Egyptian or Russian hound (I forget which), known for their in-breeding and resultant high-strung behavior and willingness to attack other animals (and small children, local tales have it). It seems that they're raised for track racing. Now that I have email going I'm hear from my development editor at Sams. They got worried about not being able to speak to me (even though I faxed them my current phone and fax numbers) and hired - at my expense - someone I praise in the book to finish author review. All that's left for me to do is hand in the "front matter" (dedication, forward, introduction, etc.). I email those items in, just in time to have it delivered to the printer, but it feels a hollow victory. The energy, and the feeling of completion, that were wrapped up in the end-game have dissapated, leaving me feel incomplete. I add the cost of being out of email touch with the US$500 I wind up paying for PowerBook repairs because Eivissa's electrical system is under-par and I realize that what was to have been a working vacation and an assistance delivery to my Uncle Daniel is turning into a financial fiasco. I return to my "lab", hook up each item in the SCSI (Small Computer Systems Interface, pronounced "scuzzy") chain, and continue testing. The half-gig drive seems to be working, but now the one-gig and CD-ROM drives are behaving strangely. I can't figure this out; this bizarre unreproducible behavior is driving me to distraction. There must be something going on here that I don't suspect, but what can it be?